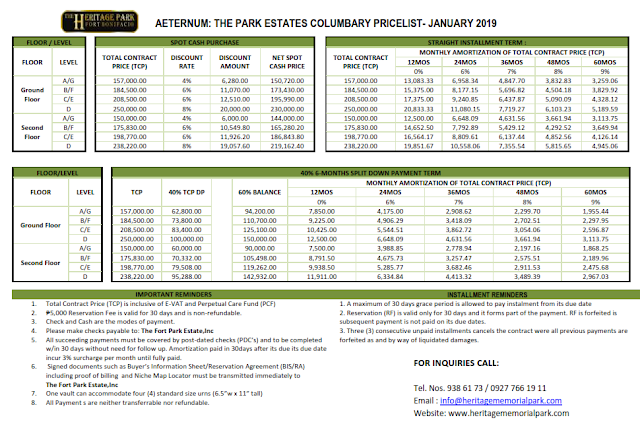 Please be advised that as mandated effective 2016 - Lot buyers is compulsory/required to purchased interment plan or any memorial / life plans (Pre-need). To know more click here . 1. Serenity Lawn Lots : Row 1-2 from the pathway is Lawn-Premium. 2. Tranquility Garden Lots: Row 1-3 from the pathway is Garden-Special Premium. 3. Charity Garden Lots: All lots are under Garden – Special Premium. 4. Remembrance Garden Lots: : Row 1-3 from the road is Garden-Special Premium. *Transfer fees is subject to price adjustments. Kindly call 02-9386173/ 0927-7661911 to verify prices. 1. Prices are subject to change without prior notice. Price above applies only to specific Lots/Inventories. 2. Each lot must be purchased together with any of our pre-need plans. 1 Lot + 1 PreNeed Plan bundled policy. Follow the link for Interment Plans, Memorial Plans or CremationPlans. 3. Price is inclusive of 12% Perpetual Care Fund (PCF) & 12% VAT. 4. Downpayment can be paid in cash or checks. Amortization payments are to be paid through post-dated checks. 5. Released of the Original Investment Certificates will only be made 6-8 months after Full Payment has been completed. 6. For At-need (gagamitin na), balance should be paid in full cash plus Interment Fees three (3) days before preferred interment date. 7. Requirements are valid id and post dated checks for amortization. 8. Please set an appointment before you visit our office. ** Note : Prices are subject to price increase. 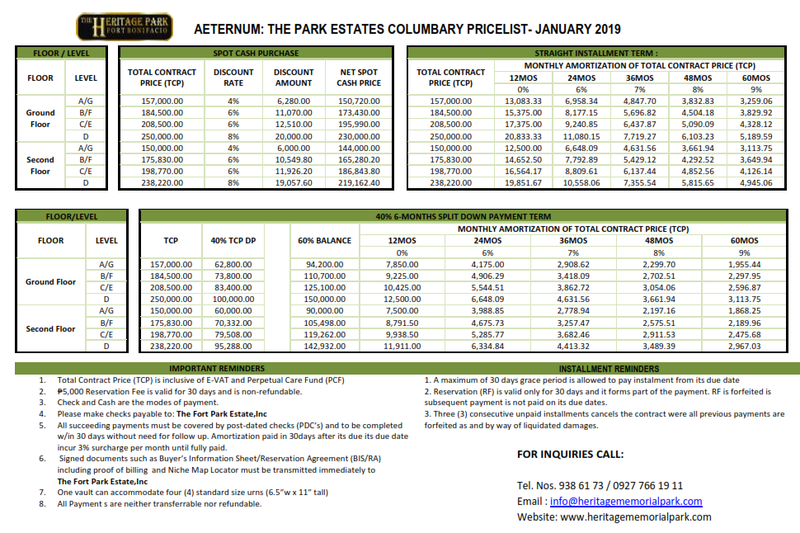 This entry was posted on 3:09 PM and is filed under 2019 heritage park price list , Estate Lot , Heritage Memorial Park , Heritage Park , Heritage Park Taguig Price list , heritagepark lots for sale , Lawn Lot , Taguig . You can follow any responses to this entry through the RSS 2.0 feed. You can leave a response, or trackback from your own site.